Listen to a sample of "Mississippi Woman"
I did time doing news on Pueblo's KIDN country radio, back in 1980, and it's possible that's where I know the name from. Local groups and singers would come in and drop off their singles for airplay, so who knows. My brain only holds so much information nowadays (grin). This is the first record I've come across on a Pueblo West record label (DJM OV 22). Unfortunately the label doesn't note a year, or any other clue, on the runoff. 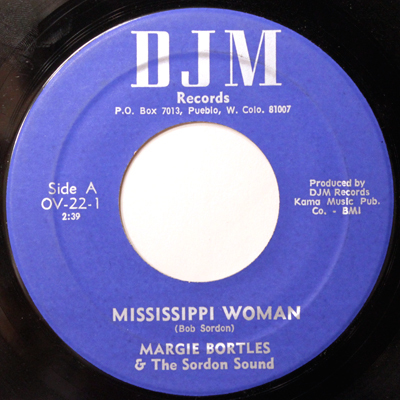 The only other name is Bob Sordon, who is listed as the songwriter for "Mississippi Woman." Margie is accompanied by the similarly named Sordon Sound band. Haven't a clue what DJM stands for (not to be confused with Elton John's early label, of course). The flipside of the single is a cover of the Wanda Jackson hit, "Silver Threads and Golden Needles." Was able to find Kama Music Publishing, in a 1973 Billboard, as a project of Larry Coryell. Whether this is the same Larry Coryell as the jazz guitarist, who knows. As always, drop me a line if you know anything.